Some people may have trouble reconciling the strong pine smell with something they would drink rather than use as a cleaning product . Note: This liqueur is produced from the fruit (cones) of the Arolla Stone Pine harvested in minute (and sustainable) quantities in mid-July. It has traditionally been paired with Austrian, French rustic, northern Italian and Swiss cuisine. Recommended serving temperature is cool/cold (around 50 F) . Appearance: Stunning clarity, pinkish red in the glass, deep red in the bottle. Pleasing on swirling, leaves a even coat on the glass with sporadic legs developing. Drinks: We found all of their proprietary recipes to be excellent, including the food ones. Bottle: Clear glass with simple, vaguely antique looking label. Long neck shows off color quite nicely. Cork with wood top finishes overall package nicely. Fairly standard presentation for a liqueur in other words. 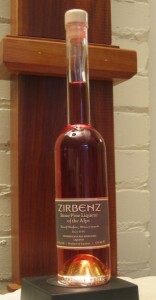 Other: Made in a small family distillery founded in1797 in Austria. Final Thoughts: The distillation is faultless and exhibits a high degree of skill.The distillers extraction, distilling and blending produced a highly nuanced product that demonstrates rare skill and a perfect understanding of their equipment and ingredients.An outstanding if highly idiosyncratic liquer. Some people may have trouble reconciling the strong pine smell with something they would drink rather than use as a cleaning product -but once you get past that it is amazing stuff. A valuable addition to a cocktailians cabinet and a new frontier for cocktails. Quick loading webpage with attractive graphics, drinks recipes, and information. Also has professional grade glassware for their specialty liqueurs for proper presentation and service.